In an interesting variation of the homopolar motor, we create a self-propelled car out of an AA battery, a few magnets and aluminum foil. Hold the tech talk - let’s see the demo first! To construct our car, we use a fresh AA battery and place a few magnets on both ends. Place the magnets with the same pole facing out from the magnet, as shown in the picture below. The magnets are attracted and stick to the steel parts of the battery. 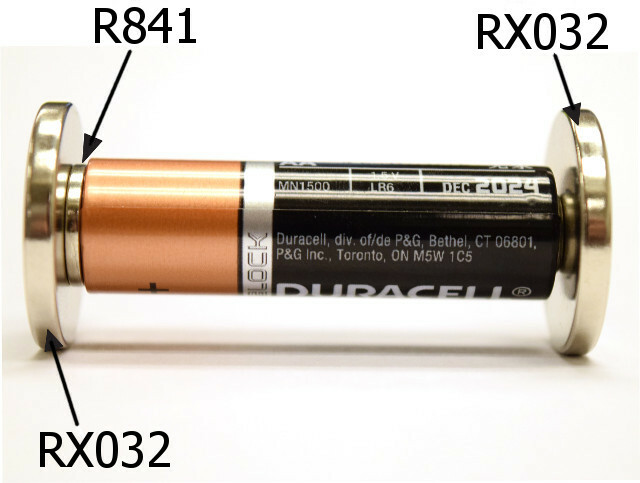 When this stack of batteries and a magnet is placed on a thin layer of conductive aluminum foil, an electric current runs through the foil. In the presence of the magnetic field, this current makes a force that propels the car. When same-sized magnets are used, the car goes straight. With a smaller magnet at one end, the car goes in circles! We love this demo because it’s so simple to re-create. It does use up batteries pretty quickly, though! This magnetic field diagram shows that there is a strong magnetic field at the aluminum foil, mostly in the same direction. This setup provides the two main ingredients of an electric motor: A flow of electric current and a strong magnetic field. We get electrical current because there’s an electrical contact between the battery, through the magnets, through the foil, through the magnets on the other end, and back into the battery. If you think this looks like a short circuit, you’re right! This car runs the battery at higher currents than you're supposed to. You’ll use up batteries quickly doing this demonstration. After a few minutes of using one, you might find that the battery is too weak to continue. The magnets are arranged with the same poles facing out. 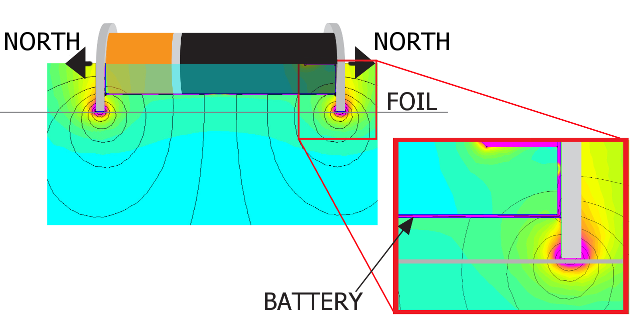 This provides a good magnetic field that’s in a uniform direction across the length of the foil (under the battery). Thus, the current is flowing through a place where there is a strong magnetic field. For more scientific detail, our previous article about Homopolar Motors has a pretty good breakdown. If you have an electric current going through a conductor that happens to be in the presence of a magnetic field, you’ll feel a force on that conductor. The pictures there show an example with an actual wire, though in this case we’re running the electricity through aluminum foil. The principle is the same. As you might imagine, here at K&J Magnetics we have access to a huge variety of magnet sizes and shapes. To find something that worked well, we simply grabbed a bunch of sizes and picked these through trial and error. We used 1" diameter RX032 ring magnets for the large magnets, and 3/4" diameter RC22 for the smaller ones. Small R841 ring magnets helped make good electrical contact and a larger, flat surface on the positive end of the battery. Larger magnets would provide a stronger magnetic field, but make the car heavier and harder to push. Thinner magnets don’t provide a magnetic field quite as strong, nor stick to the battery with as much force. Try a few sizes of discs and/or rings like these for your own experiments! 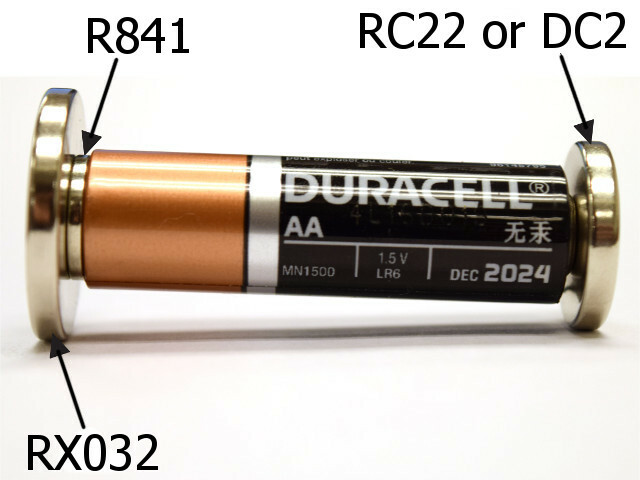 We had good luck sticking these straight to the battery, but the casing around some batteries might prevent the magnets from making good electrical contact. If you find this problem, you might take a tiny piece of foil and sandwich it between the magnet and the battery, helping ensure good electrical contact.